Kinda cool! Should be cheaper tho. Ben. While many of us are focused on the latest and greatest consumer tech, there are many parts of the globe still waiting for utilities we take for granted -- like electricity, running water, and access to the internet. Developing nations do have access to cellphones, however. Vodafone is keenly aware of this fact, and its latest product, the Webbox, will bring the internet to anyone with a TV and access to 2.5G or EDGE networks. 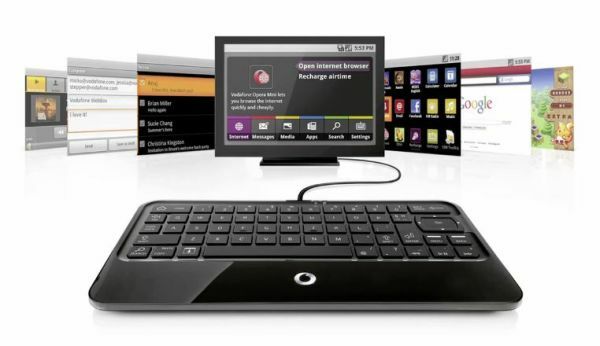 The Webbox is essentially a QWERTY keyboard -- with the data hardware from a phone stuffed inside -- that connects to a TV through basic RCA cables and allows for a relatively speedy internet experience by compressing data by around 90 percent. It's dead simple to set up, as you simply plug in the RCA's and switch on the device -- an Opera Mini browser pops up on screen and allows users to start surfing the world wide web immediately. An app store, some games, and a text editor are baked into the portal, and the ability to send email and SMS messages is included is well. Vodafone is selling the device -- which comes with a 2GB SD card and 100MB of data -- in South Africa for 749 Rand ($102), with other markets and a two year contract plan to be added later this year. Check out the Webbox, and all its elegant simplicity, in the video after the break. Vodafone announces Webbox, gives internet access to the developing world originally appeared on Engadget on Wed, 16 Feb 2011 03:07:00 EDT. Please see our terms for use of feeds.